Christine de Pizan composed herfamous defense of women, Le Livre de la Cité des Dames, as a response to the misogynistic writings of the time. She used the allegorical form to present the life and deeds of virtuous women as the metaphorical building blocks for the City of Ladies. In 1475, some forty-five years after Christine`s death, Jan de Baenst, a descendant of a prominent Bruges family, ordered a translation. Het Bouc van de Stede der Vrauwen is the only Middle Dutch translation of a work by Christine de Pizan and it has survived in only one manuscript. 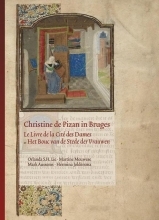 Christine de Pizan in Bruges tells the story of this unique codex by focusing on the background of the commissioner, the codicological aspects, the highly original but unfinished illumination program - the 41 miniatures executed are reproduced here in full colour - and the translator`s personal epilogue.